Broadway - The Greatest Hits is a glamorous show takes you on a fast-paced musical journey to New York City to experience nearly 50 musical arrangements from over 25 different Broadway classics. Enjoy spectacular highlights from some of the greatest Broadway musicals including 42nd Street, Phantom of the Opera, Les Miserables, Cats, Chicago, Oklahoma, A Chorus Line, Hairspray, and many more. Dublin’s Irish Tenors & Celtic Ladies feature Ireland's finest tenors and four fabulous females mix traditional Irish tunes, Opera, Pop, Swing, and Classical in a show for all ages! Including songs like "When Irish Eyes are Smiling", "Danny Boy", "You Raise Me Up", "Rose of Tralee", "Nessun Dorma", "Hallelujah", and many more! 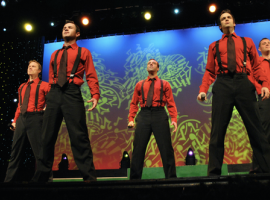 You'll be enchanted by their charm, exceptional harmonies, and skillfully choreographed dancing. New Jersey Nights is a nostalgic trip down memory lane to celebrate the hit songs of Frankie Valli and The Four Seasons. This show delivers first-class musical arrangements, perfect harmonies, custom sets and a full cast of dancers. Sing along to the greatest hits including "Sherry", " My Eyes Adored You", "Big Girls Don't Cry". "Walk Like a Man", and "Oh What a Night! Sinatra & Friends, new for 2018, is the smash hit multi-media celebration of the music of Frank Sinatra. This glamorous, all-singing, all-dancing production takes you on a breathtaking musical journey through all of Sinatra's greatest songs, together with the number one hits of leading recording artists of the Sinatra era. This is not an impersonator show. It is a full scale musical celebration made up of superb singers, amazing dancers, and unique film footage. The great man may be gone, but his musical legacy lives on! Christmas Wonderland is one of Branson's largest holiday productions. A sparkling cast of singers and dancers takes you on an unforgettable and magical sleigh ride to a grand Christmas extravaganza. Candy-striped costumes, lively choreography and heart-stirring voices create magic as the cast whisks you away from the cares of the day. Christmas shows begin October 31! Guests will be sure to enjoy each of these shows at the beautiful King’s Castle Theatre! Call us to book your tickets now, 877-368-3782.